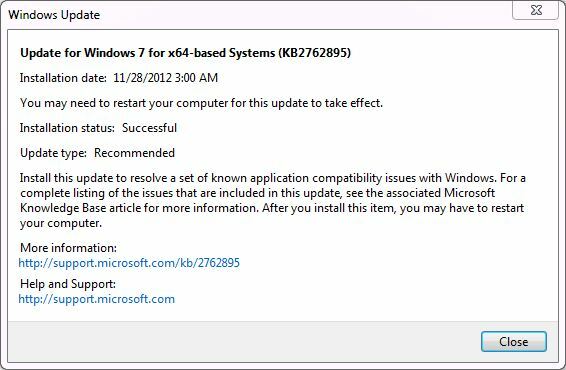 Yesterday, Microsoft pushed an out-of-band (non-Patch Tuesday) update labeled KB2762895, which is designed to address application compatibility issues with Windows. Since its release, various parties have reported issues ranging from annoying to serious. I found something interesting with Internet Explorer in its wake that I figured out how to fix myself. Here is the “Show Details” blurb from Windows Update’s Update History. 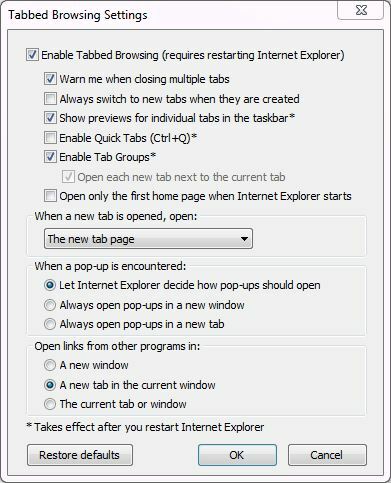 After the KB was installed, I started getting my default home page when I clicked the New Tab button in IE 9, instead of the familiar and desirable New Tab page. 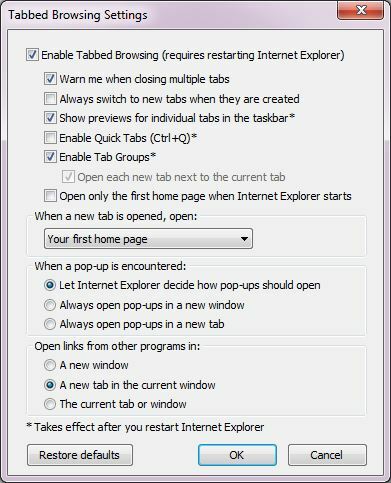 A quick jump into IE’s Internet Options General tab in the Tabs pane showed that the “Your first home page” option was now selected for the “When a new tab is opened…” control. A quick hop into its pull-down menu let me restore it to the default selection “The new tab page” as I prefer it to be. I’ll be curious to see what other reports of difficulty appear after the patch has had a chance to hit more desktops. This looks like one you’ll want to watch carefully, and be on the lookout for unforeseen and unintended side effects. Stay tuned, and I’ll report further as I learn more. I had to reinstall my windows after the kb2762895 my ie8 32 bits and ie9 32bit dont work anymore. I narrowed it down to this bogus patch by installing all patches from november 13 until nov 27 one by one to see which one was doing this. The complete ie froze time after time after submitting a link. Nice work from Microsoft. it took me a day of work and irritation. System: Intel i5-2550 3.4G, 16g RAM, Win7 Pro. I had major problems after installing KB2762895. It installed automatically 11-28-12 as I was shutting down. The next morning upon startup I experienced a BSOD when connecting to the internet. When attempting to startup after the first BSOD, I started the machine in Safe Mode without network connections. This was fine and I was able to look into the Event Viewer and locate multiple issues in the 'Applications' and 'System' modules that indicated the problems started on the first boot after the Windows and Norton Internet Security 2012 Updates 11-28-12. After restarting from Safe Mode, the machine would boot to the Windows splash screen, then..BSOD! After going through this multiple times, I ended up Restoring to the first 11-29-12 Restore Point. This had no effect. Then I went to the first 11-28-12 Restore Point and was able to boot, but Norton would not activate security. Then Norton Internet Security 2012 (NIS2012) would try to access 'LiveUpdate' and would get so far and then return an 'Error 3047,40000' message. After re-booting several times and trying multiple problem solving techniques, I finally gave up and decided to call Norton Help. The gentleman there, Pavreen, was a tremendous help for the next 4 hours (!) as we tried to fix the problem. We ended up trying multiple fixes, in the end using Norton Eraser and doing a complete re-install! This time when Windows Update tried to install KB2762895, I declined and started researching the issues other people have been having and decided to 'hide' the install. My conclusion: After wasting 10 hours of what could have been productive time, I suggest to everyone to not accept KB2762895 until MS comes up with a fix! None of my 32bit browser (firefox, chrome, ie) is working after installing kb2762895. used the recover option (several times) to narrow it down to this patch.